StockMaster Tracker is a very versatile and easy to use mobile work platform. With two large diameter wheels it moves easily over sealed and unsealed surfaces or slopes making it ideal for indoor and outdoor use. A single control to Steer and Brake makes it fast and easy to move around. To raise the unit to the mobile position take hold of the control and to move to the job. Release the control and the Tracker returns automatically to the stationary mode where it is braked and totally stable. 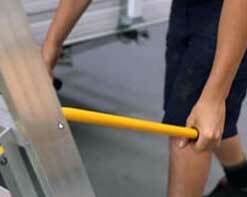 When moving the ladder you are positioned away from the front of the ladder to allow a normal walking step. Tracker moves easily to the job in much less time than competing products and requires no set up when you get there. 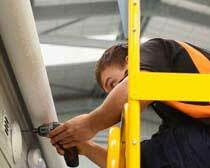 The Tracker Mobile Work Platform is easier and faster to move around and saves time on the job. Move up to StockMaster Tracker Pro and you are protected against accidentally stepping off the front of the platform. With the fully automatic StockMaster Auto-Gate your hands are free to carry an item and still maintain a safe grip as you enter or leave the work-space. And with Tracker Pro you also have StockMaster Rota-Gate which provides a gate-way at the side of the platform creating easy access for stock-picking, inspection and many other tasks. StockMaster Tracker is a modular design enabling parts replacement in the event of accidental damage. It is manufactured from high-quality materials and built to last. With reasonable care a StockMaster Tracker Mobile Work Platform will give many years of service, and get the job done. StockMaster Tracker Platform Ladders . . .
Tracker is easier and faster to move around and saves time on the job. 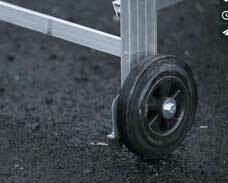 With two large diameter wheels Tracker moves easily over sealed and unsealed surfaces. StockMaster TrackerPRO features a Safety Rail system that can be adjusted to your task.